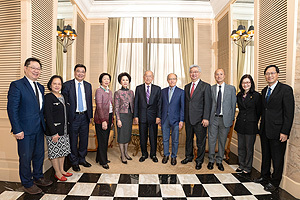 Council members of Lam Woo Foundation Mrs Ellen Lam (second from left), Mrs Mary Lam (third from left), Dr Samuel Lam (fourth from left) and Mr Hamilton Lam (first from right) present a cheque of HK$ 5 million to the OUHK. Council Chairman of the OUHK Mr Michael Wong Yick-kam (third from right), Deputy Chairman Mr Silas Yang Siu-shun (second from right) and President Prof. Yuk-Shan Wong (first from left) receive the cheque on behalf of the University. The University is grateful for the generous gift from Lam Woo Foundation to support the development of its new Jockey Club Institute of Healthcare. 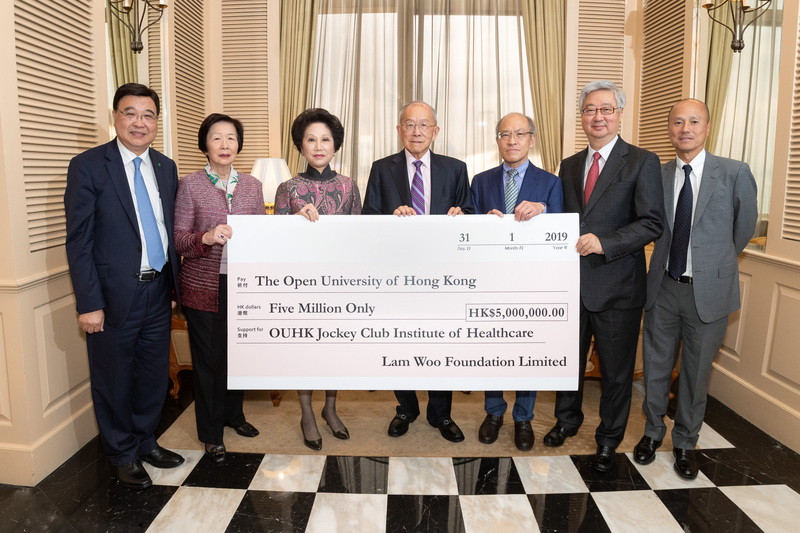 A cheque presentation ceremony was held today (31 January) in gratitude for the HK$5 million gift from Lam Woo Foundation Limited (Foundation) to fund the development of the new Jockey Club Institute of Healthcare of The Open University of Hong Kong (OUHK). At the cheque presentation ceremony, Chairman of the OUHK Council Mr Michael Wong Yick-kam expressed his heartfelt thanks to the Foundation for its exemplary generosity. He said, "Lam Woo Foundation has always been supportive of education. We are honoured to receive the gift from the Foundation which is also the first donation made by them to our University. The benefaction not only enables us to further expand and enhance the campus environment for our students, it also allows us to contribute to the society." The new Institute will be home to a suite of academic programmes that aims to nurture the necessary professionals in response to the community's growing healthcare needs arising from the aging population. Lam Woo Foundation was established in 1986 by the Lam Family in memory of the late Dr Lam Woo, a well-known master builder and philanthropist. 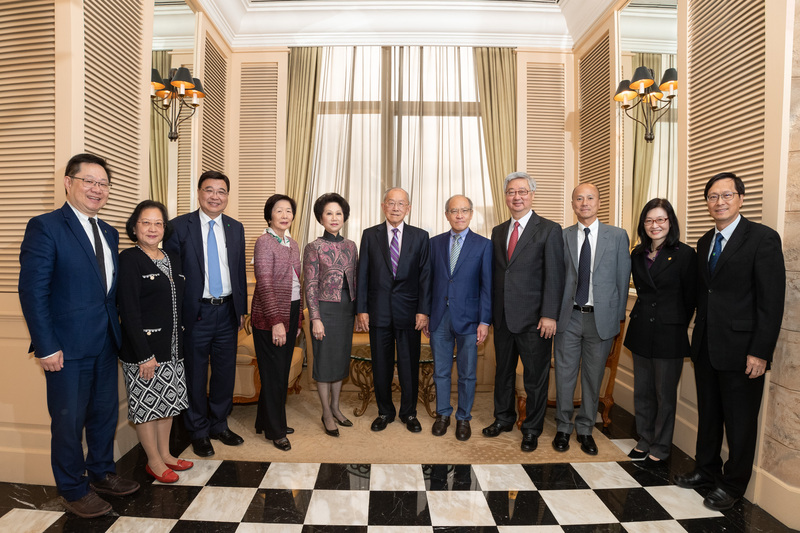 Over the years, the Foundation has made numerous contributions to support education, social welfare and medical facilities in both the mainland and Hong Kong. In the face of challenges brought by an aging population and the growing pressure on healthcare services, the OUHK has embarked on a HK$850-million campus development project on Sheung Shing Street, Ho Man Tin in 2017. The new OUHK Jockey Club Institute of Healthcare will be equipped with the state-of-the-art facilities, providing students a conductive environment for learning and exchanges of ideas. It is expected that about 2,800 students will be benefited from the new learning facility every year upon its completion in 2020. In addition to nurturing the next generation of healthcare professionals, the new Institute will also act as a hub for developing community initiatives to promote the well-being of the general public. To learn more about the OUHK Jockey Club Institute of Healthcare, please visit: http://ioh.ouhk.edu.hk/ . Established by the Government in 1989, The Open University of Hong Kong (OUHK) has developed into a full-fledged university providing high quality and flexible university education at various levels to secondary school graduates and working adults. As a dynamic and innovative university, the OUHK currently offers about 220 programmes to nearly 10,000 full-time students and about 9,000 part-time students. Our mission is to advance learning, knowledge and research that meet students’ learning aspirations and society’s talent needs, focusing on practical and professional programmes.